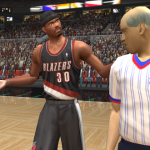 Not all of the cutscenes in NBA Live 2003 were silly and comedic. There were also some fairly mundane ones such as the coach taking in the action on the sidelines, or the bench getting upset with a foul call. A couple of the pre-game cutscenes were quite normal as well, with teammates bumping fists and getting into position for the tip-off. However, other scenes featured hi-jinks such as a player messing around with his teammate, and one of the centres stealing the ball from the referee while waiting for the tip, Harlem Globetrotters-style. Fairly harmless, and a minor complaint compared to some of the issues with NBA Live 2003’s gameplay, but as I mentioned, it just wasn’t the tone that most of us were hoping for. The frequency of the comedic cutscenes didn’t sit well with anyone who was hoping for a more serious sim atmosphere. A player goofing around and stealing the ball from the referee does make for an amusing scene, but it’s not something you’re likely to see too often in the NBA. Only certain players are prone to messing around like that, and even they are unlikely to do so in important games. Seeing that cutscene before a crucial Playoff game kind of took you out of the moment. After all, there’s a time and a place for goofing around, with the All-Star Game being a prime example that springs immediately to mind. In an elimination game, you’d be very unlikely to see a team’s sixth man prank his coach by stealing his seat on the bench. In fact, it’s not really something you’re likely to see during most regular season games, either. Needless to say, it was a scene that you’d encounter quite often in NBA Live 2003. Here’s an example that I captured, featuring Robert Horry and Phil Jackson. As I alluded to earlier, the comedic cutscenes didn’t always line up with the personalities of the players featured in them. This is ultimately what made some of them so ridiculous and funny, and it happened a lot since the scenes were generated using set positions in the lineup and bench order. This meant that a no-nonsense player could end up stealing his coach’s seat on the bench, or hiding the ball from the referee before tip-off. A normally level-headed player could randomly start an argument with a referee, following an intentional foul or clear infraction. Perhaps the most entertaining example of this is one of the timeout cutscenes. There are a couple of regular timeout cutscenes in NBA Live 2003, but there’s also one that involves whoever’s currently in the game at centre chewing out the player who’s at small forward, for not paying attention to the coach. It’ll always be those two positions in those same roles, which can easily result in a young player giving an earful to the team’s star player. With the Washington Wizards, that means you can see the highly unlikely scenario of Kwame Brown chewing out Michael Jordan. Just for fun, and to further demonstrate how it all works, I placed MJ at centre and Kwame Brown at small forward, which results in a scene that was far more likely to play out on those Wizards squads. Speaking of the player who’s in the game at centre, as you head to the locker room at half time, the visiting team’s man in the middle will approach a fan and sign an autograph, much to the annoyance of his coach. The fact that it’s a visiting player is funny enough, but it’s even more amusing if it happens to be a benchwarmer. If you’re controlling the away team, this is obviously something that you can manipulate with a timely lineup change before the end of the half. It should be noted that despite the amount of flak that many of us old school basketball gamers give to the cutscenes in NBA Live 2003, we’re still talking about them all these years later. For better or worse, they were certainly memorable. Looking back, I can enjoy them for what they were and get a chuckle out of them, but I’m glad that NBA Live quickly moved away from the concept. In a way, those cutscenes sum up the general atmosphere of NBA Live 2003, and some of the missteps that the game took. Once again, that’s something I’ll talk about in more detail in my upcoming retrospective. You know what, though? Those courtside comedy cutscenes might have been worth it, just so that all these years later, I can capture a video of the absurd visual of Kwame Brown yelling at Michael Jordan for daydreaming during a timeout. In fact, it just might be even more ridiculous and amusing than my MyPLAYER being terribly miscast in NBA 2K16’s “Livin’ Da Dream”. I remember traded player walking out of the locker room while former teammates talking to him. Was that Live 03 as Well? That was NBA Live 2004.